Terrorist of Abbas's Fatah faction holed himself up under IDF siege, killed in exchange of fire; anti-tank missiles found in his home. IDF forces eliminated a wanted terrorist on Monday morning just south of Shechem (Nablus) in Samaria, in a joint operation of IDF and security forces. The terrorist had been involved in terrorist activities against Israel. IDF forces surrounded the house, at which the terrorist attempted to entrench himself in his home and refused to turn himself in peacefully. All attempts to convince him to leave the home were ignored, until without warning the terrorist opened fire on the IDF forces. An exchange of fire broke out, during the course of which the wanted terrorist was shot dead. Two soldiers reportedly were lightly wounded in the exchange of fire. Afterwards, security forces uncovered a stash of weapons in the house. The terrorist was named by local Arab sources as Zakaria al-Akra, a member of Palestinian Authority (PA) Chairman Mahmoud Abbas's Fatah faction, reports AFP. They also gave Kablan as the name of his village where the operation occurred. An IDF source said Al-Akra had been part of several shooting attacks on IDF troops near Shechem, according to Walla!, which reported that al-Akra was killed when IDF forces bulldozed his house after first firing a rocket at it. It added that five other local Arabs were wounded in the confrontation, and three were arrested. "The terrorist barricaded himself in his location despite repeated calls for him to turn himself in. 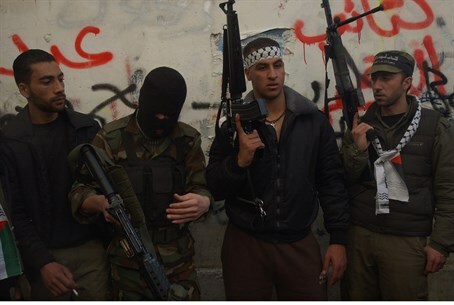 Following gunfire from the suspect, the troops responded with lethal force," an IDF spokesperson told AFP. She added that several "improvised anti-tank missile launchers" were found in his house. Abbas's Fatah party includes a military wing terrorist organization, the Al-Aqsa Martyrs Brigades, which claimed a shooting attack on "a group of Zionists" near Bethlehem just this Sunday. It also claimed responsibility for a failed shooting attack last Sunday in Neve Tzuf, Samaria. Fatah has called for the ethnic cleansing of Jews from Israel, and declared "open war" on Israel late last month. Just this Sunday it claimed having murdered "11,000 Israelis."